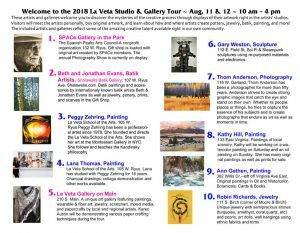 Ten La Veta artists and galleries invite you to discover the mysteries of the creative process on the free 2018 self-guided Studio & Gallery tour. Meet the artists, enjoy art demonstrations and displays of artwork, purchase art directly from the artists including paintings, batik art, jewelry, fiber art, and pottery. Pick up brochures with maps at the SPACe gallery in the park and browse the artists’ studios and three art galleries at your own pace. Artists on the tour include Jonathan & Beth Evans (Batik), Peggy Zehring (mixed media), Lana Thomas (acrylic and charcoal), Gary Weston (sculpture), Thom Anderson (photography), Kathy Hill (painting), Ann Gethen (painting), and Robin Richards (jewelry). The galleries include Shalawalla Batik Gallery, with an amazing collection of fiber art and wearable goods both locally made and from India. 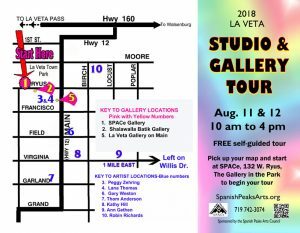 The La Veta Gallery on Main, featuring a wide array of original paintings, wearable & fiber art, jewelry, and many other unique handmade items. The SPACe Gallery in the Park will be showing the outstanding 2018 Photography Show, a collection of photography by 25 area artists in a wide range of subjects and styles. The show was judged by Cuchara photographer, Jeff Stovall for awards in 3 categories.